The hard part about plumbing is the rough-in. The last step of connecting the sink, toilet, or tub is almost superfluous. Get the rough-in right, and you are 90% of the way there. 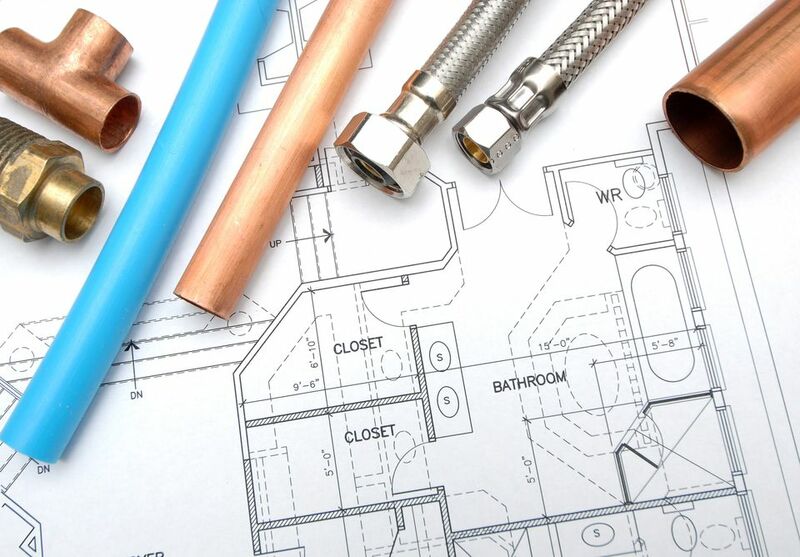 Below are generally accepted plumbing rough-in measurements for sinks, toilets, and tub/showers. If you find the numbers alone cryptic, reference the details below the table. Also, see Notes at the very bottom for an explanation of the term "centerline." Discharge/Drain Hole From Back Wall 12 1/2" N/A 14"
Discharge/Drain Hole - Vertical 0" 16" to 20" 0"
Supply Line - Height: Ideally, 8 1/4" above the floor. This cold-water-only pipe will create one hole between 5-10" above the floor. Supply Line - Horizontal: Imagine a centerline running vertically through the center of the toilet. The supply line hole should be 6 inches to the side of this centerline. Check your toilet to see which side the water supply intake will be, though it probably will be on the left side. Discharge Hole From Back Wall: Off-set this hole from the back wall by 12 1/2". Discharge Hole - Vertical: Since this is located at floor height, the distance is zero. Fixture - Side to Side Buffer: Measuring from the center point of the toilet outward, the bare minimum from side-to-side for a toilet is 15 inches to any wall or other fixture. It is recommended, though, that you increase that distance to 18 inches for more comfort if your bathroom layout allows. Fixture - Front Buffer: From the front rim of the toilet, leave a space of at least 21" to the nearest obstruction. The recommended buffer is 30". Supply Line - Height: Two holes. Vertically, both holes are about 2-3 inches above the drain pipe. Discharge Hole - Vertical: About 16-20 inches above the floor. We will consider the drain pipe to be a vertical centerline. Fixture - Front Buffer: Minimum distance to nearest obstruction is 21". Recommended is 30". Placement of Sink: Vertically, the sink should be about 31 inches above the floor. Measure up to the rim of the sink. Shower Supply - Vertical: 80". This is the highest point, the place where the shower nozzle will go. Tub Supply - Vertical: Stubs 18" high. 10" above tub spout. Place one faucet 4" to the left of centerline and the other faucet 4" to the right of centerline. Discharge Hole From Back Wall: Place drain on the centerline. Total opening for drain access can be between 10"-14" off-set from framing, and 6"-8" wide. Fixture - Side to Side Buffer: 18" minimum required buffer. Fixture - Front Buffer: 18" minimum required buffer. Centerline: When we speak of dimensions, the word "centerline" is used. As with the term "on-center," which is used for construction, the term "centerline" is an imaginary vertical line drawn through a key reference point (usually the drain pipe). So, if two pipes are ten inches apart, we measure from the center points of each pipe, not the edges. Base Floor Height: Also base floor height is considered to be the subfloor (in new construction) or finish floor (in remodeling). Not all of these dimensions are set in stone. Consider them general guidelines. They will vary according to your bathroom. Consult the instructions that come with the fixture (sink, tub, etc.) for more precise dimensions.